These short winter days and dark icy nights call for some gentle down time, self-indulgence and general hibernation. At this time of year the sun makes a rare appearance so energies run low; throw in the added pressure of new year diets and exercise regimes and it’s no wonder that many of us find ourselves frazzled by the end of January. Our message is simple: beat the winter blues and discover the Joy of Staying In! Wrap yourself up in a soft wool blanket, get the fire going, light all your candles, and sit back warm and snug in your home-haven. With this in mind, Mel has recently refreshed her living room/ snug and wanted to share some tips with you on how to create a cosy, evening, grown-up space to cocoon yourself in once the kids are in bed. You won’t even want to entertain the idea of going out! I am a huge fan of soft greys, warm whites and the whole ‘scandi’ vibe, but for this room I wanted it to feel cosy, indulgent, warm and with a touch of boho-glamour. Since this is a cool north facing room that we use mainly in the evenings, it made sense to go dark having lived with a coolish Conforth White for the last 4 years. Having tried out many tester pots, we eventually opted for the dark and rich Farrow and Ball Stiffkey Blue. This is a deep and moody blue, that has a warmth and grown-up glamour to it, and in the day time with the light on it it softens to a blue-grey that I love. We painted out all the wood work, skirting and back of the door in the same colour for a cocooning vibe. It is all too easy for your flat screen TV to become the focal point in your living room. One of the advantages of a dark wall colour is that it helps the black screen of the television to blend away into the background and by then adding a wood-burner to your fireplace you immediately create a charming new focal point to your room. The hearth this creates provides a lovely opportunity to add a little colour, pattern and personality to the space with your choice of tiles. 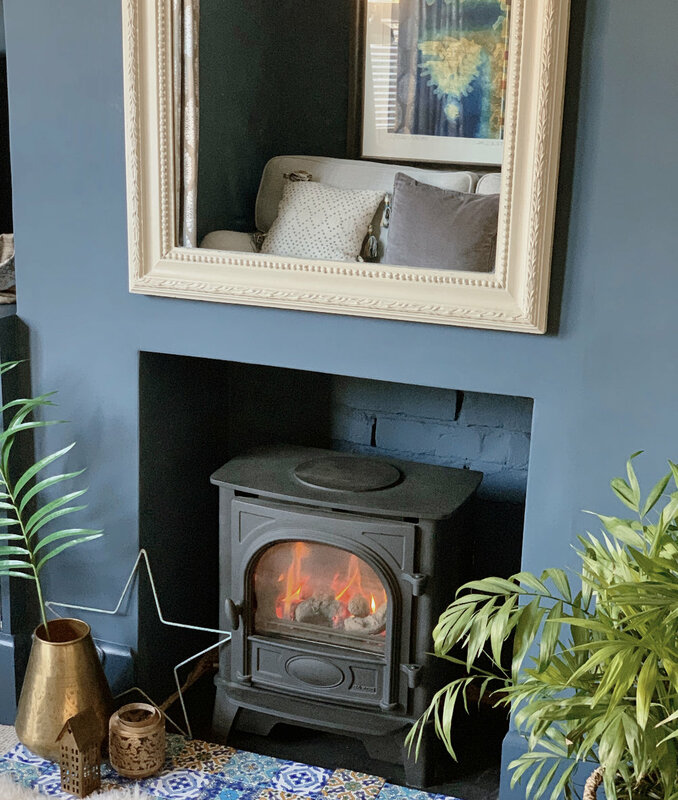 There are so many out there to choose from, from Moroccan stars to Parisian inspired painted porcelain, just be sure to check they are hearth-safe as they will get hot. We live in a smoke-free zone so a real wood-burner was not an option for us, and I have to say having been unsure about this gas version at first, we have not looked back. It fires up at the touch of a (remote controlled) button and heats up the room in seconds. No faffing around building up the log pyramid and puffing frantically to keep it going, and no ashen mess to clear up either! Layering up textures and mixing up fabrics creates a maximalist, cosy vibe. Here I have layered sheepskin rug upon sheepskin rug for a feeling of warmth and comfort. Layering woollen blankets with velvet cushions on the sofa, and even silver tray upon wooden tray on the buttoned footstool, are a feast for all the senses to enjoy. So you all you need to do is sit back, relax and experience the pure joy of staying in! Even an evening room will feel enriched with the addition of plant life. Not only do they cleanse and purify the air, but the deep greens look sumptuous against a dark wall colour. Bringing nature inside can really help to bring a room to life, and contributes to a feeling of calm and relaxation. I think the plants have helped to make a small space feel bigger and add an other layer of relaxation to the snug. Here is our Cocoon board of ideas for bringing that COSY vibe into your own home.